Celebrate With Us and Get The Party Started Right! At Celebrations, we’ve been specializing in weddings, corporate events and other special occasions for over 35 years. Choosing the right DJ is one of the most important decisions you will make when planning your wedding or event! We believe that an experienced talented interactive DJ along with expert detailed planning is the key to a perfect wedding or event! We listen when you tell us what you are looking for and design your wedding or event with you the client in mind. We will tailor your event so it’s about you and not us. We are more than just DJs – consider us your wedding coordinator. We will meet with you and create an itinerary for the entire day to ensure that your day is spectacular. We also believe great music choices make or break your event as well! Our music library consists of over 100 thousand plus digital songs which means we always have the music you want. We carry all different genres of music that you and your guests will enjoy. We will work with you from your ceremony music to your cocktail music to the precise music for dancing all night long – all in an effort to deliver you the wedding or event of your dreams! We will personalize and suggest many ideas from exciting introductions, special dinner songs, centerpiece games, parent dances and anniversary dances to fun memorable last dance songs to end the day. Thus creating memories one celebration at a time. Non-denominational Minister, Jim Gagnon, has been performing weddings, vow renewals, etc. for over 10 years… Personalized, professional, preplanned formal to informal, traditional or modern with all of those special touches to make your day special. Professionally dressed in robe or suit you decide. We preplan with you in mind and honor all of your wishes for that dream Ceremony! 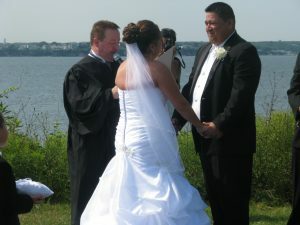 We perform marriages throughout New England in Churches, Country Clubs, Reception Venues, Homes or by the Sunny Sea Shore! Officiant Services can be booked along with any of our other services or individually! Rehearsals available at an additional charge depending on location! Ceremony Sound Systems with Microphones, Tech and Music Available at additional charge as well! Battery Operated Systems available for those locations without power! Let us create a special memory for you! *Officiant Services …$250.00 (same location…) includes planning! *Photo Booth…Prices range by hour from $495 to $795 etc. and subject to availability! *Mirror Booth …Call for price and availability. *Décor Package-Pipe and Drape,Furniture,etc…Call for Pricing! *Discounts May Apply with Booking Other Services! NOTE: PRIVATE PARTY OR CORPORATE PRICING WILL BE PRICED ON A INDIVIDUAL EVENT BASIS! PLEASE CALL OR E-MAIL FOR AVAILABILITY AND A NO OBLIGATION QUOTE! CELEBRATIONS ENTERTAINMENT CREATING MEMORIES ONE CELEBRATION AT A TIME!